The sole female member of Buccellati's gang. 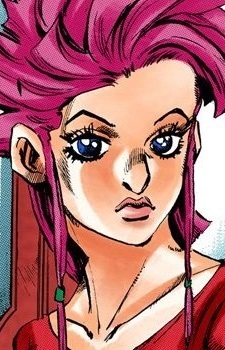 She is the daughter to their boss, Diavolo, and was living a normal life before she found out who her father was. From then on, she was on the run to meet her father. When she finally got to her father, she learned that he actually wanted to kill her, so all his ties with the past would be erased, including the people related to him. On her journey with Buccellati's gang, she was able to awake her stand power, Spice Girl, that was laying dormant within herself. "Spice Girl" can greatly increase an object's elasticity, making it nearly indestructible.